The worst bankruptcy in the world is the person who has lost enthusiasm. Depending on the quality of thought, there can be positive vibration or negative vibration. We feel happy or sad in each other company depending upon what kind of vibration one has. That is why with some people we always feel happy, even if they are not so close to us. While we dont found our self enjoying in company of someone who is even closest to us. It is all because of their (negative) vibrations. Surround yourself with Positive vibrations. Positive vibration has power to heal the mind, body and soul. Expectation is what design and defines your day determined through positivity or negativity of your mindset. It's incumbent that you separate yourself from negative persons, places, and things. It's the only key to succeed. Do away with anger as anger is poison, it will eat away your very essential. Do away with fear, fear is awful, face it. Memories are sweet. Cherish them. Insecurities are like silent killers. They can ruin your entire life. Those who gossip evil things about others should remember that no one is perfect including themselves. Drama does not just walk into your life. You either create it, invite it, or you associate with people who love to bring it into your life. Beauty is not the appearance of someone, but, it is their personality and how they are on the inside, as well as their heart. Even the most beautiful of people can have the most ugliest of hearts. While, even the most ugliest of people can have the most pure and wonderful of hearts. Sometimes beauty is just a mask to hide the ugly inside them. 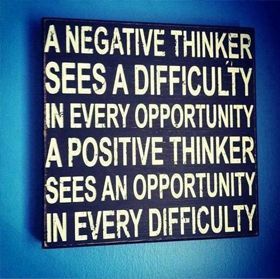 Negativity is a pessimistic attitude. Someone who has a negative attitude leads a negative life. When someone has a negative approach towards life, he cannot view the brighter aspect of things. A negative person is characterized by habitual skepticism a disagreeable tendency to oppose or deny or resist commands and suggestions. Negativity kills hopes, aspirations, the desire to make things better and move on. When an adversity strikes, a negative person easily gives in and becomes hopeless instead of rising to the occasion and facing it valiantly. Negativity should be replaced with an optimistic attitude. Optimists always stay strong even when the going gets tough. Negativity and a negative attitude towards life will poison your life and you will never be able to attain your goals and realize them. A positive attitude is the key to success in life. Life's battles are mostly fought in the mind. If the mind stays cool, positive and focused under all circumstances, it can resist all kinds of negativity and move forward.